One of the most requested features on Facebook over recent years has been the addition of a “dislike” button to run alongside the “like” feature. Well it seems Facebook have been listening. Facebook chief Mark Zuckerberg confirmed in a conference call that “pretty soon” the new Reactions feature would be available to its 1.5 billion users. Mark Zuckerberg went on to discuss that giving a range of options rather than a simple opposite emotion to the LIke button, added “a little bit of complexity” saying “when you only have a Like button, if you share a sad piece of content or something that makes you angry, people may not have the tool to react to it”. The new Reactions feature is currently on trial in several countries and will involve Emojis for “love”, “wow”, “haha”, “sad” and “angry”. Let us know what you think, does this get the traditional Facebook thumbs up from you? Or is it a poorly thought out gimmick? This entry was posted in News and tagged Emjois, Facebook, Mark Zuckerberg, social media on January 29, 2016 by admin. Today’s tip focuses on this little chap. 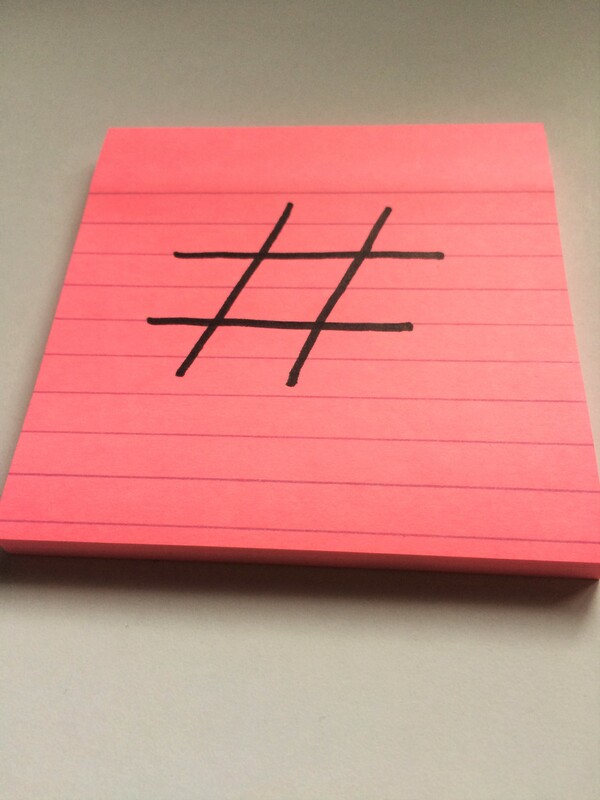 The hashtag. Let’s face it, before Twitter what on earth was this character for?! 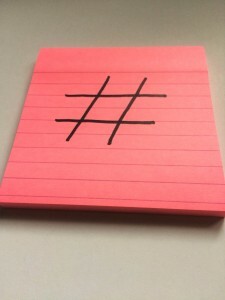 Now however, the hashtag is a useful tool – you can use a variety of hashtags to get your tweets noticed. You can either create your own or simply find out what is trending and utilise current popular talking points to get what you want to say out there. A word of warning though. #Don’t #over #use #the #hashtag. #It #can #get #really #irritating. See what I mean? See you soon for more snippets of social media advice! This entry was posted in Tips on Tuesday and tagged Hashtags, profiles, social media, Tips On Tuesday, Twitter on January 26, 2016 by admin. Today’s bite size chunk of advice concentrates on Instagram. Instragram made its name as an image sharing platform, but remember you can use text as well. Don’t be afraid to use detailed description alongside excellent images. A well written description can really put an image into context and capture someone’s imagination. And always, always make sure your website address is visible! Remember, half the battle on social media is getting seen! See you next time! In the meantime, why not browse back through our previous tips and find out what might work for you? This entry was posted in Tips on Tuesday and tagged customer, followers, Instagram, social media, Tips On Tuesday on January 19, 2016 by admin. Welcome to the first Tip on Tuesday of 2016! Our first tip is short and sweet and focuses on Facebook and is simply this; if at all possible, post directly to Facebook rather than using a social media management tool. Facebook algorithms are created to favour content posted personally, meaning you have a greater chance of your content appearing in people’s timelines. Our Tips on Tuesday section is really about helping you – so let us know what you would like advice on and we will make sure you’re featured! This entry was posted in Tips on Tuesday and tagged Characters, Facebook, social media, Tips On Tuesday on January 12, 2016 by admin. Hot on the heels of Twitter implementing their new “Moments” feature, which you can read about here, there is a story growing that Twitter plan to increase their character limit from 140 to 10000, which is the same character limit their direct message feature uses, Re/Code have reported. I don’t think anyone can be unfamiliar with this sight – you’re composing the perfect tweet, when suddenly the red numbers light up and you have to chop down your message whilst still retaining some vestige of grammar. 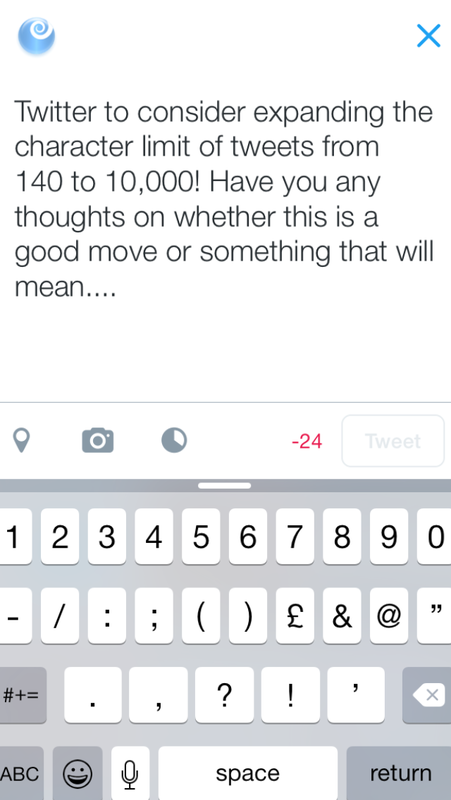 It cannot be denied that at times the 140 character limit can be challenging, but it also makes for dynamic messages. There is no official release date for this project, which it has been reported as being named “Beyond 140” inside the company, but it is thought that the changes, should they go ahead, will be implemented in the first quarter of 2016. Whether this comes to fruition or not, it is certainly something that will result in furious discussion amongst Twitter uses. So, your thoughts? 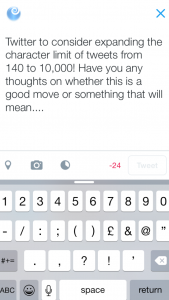 How would this new feature affect your usage of Twitter? Let us know! This entry was posted in News and tagged Characters, social media, Twitter on January 6, 2016 by admin.